Explanation: Gazing skyward on a sunny day in May, photographer Jean-Marc Lecleire captured this engaging display of ice halos forming complete circles in the sky. Recorded with a fish-eye lens from a spot near the grand Ch&acirc;teau de Chambord in France, the picture looks straight up, spanning almost 180 degrees from horizon to horizon. 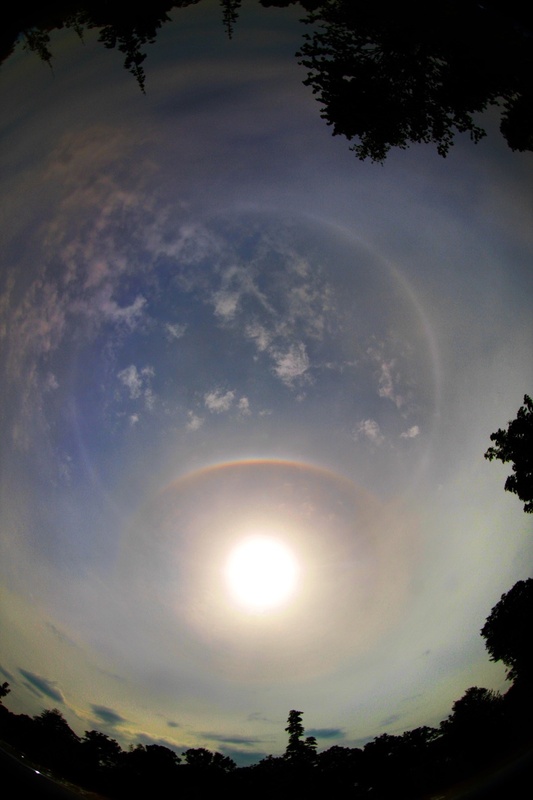 Surrounding the Sun is a halo formed by sunlight refracting through hexagonal-shaped ice crystals in high, thin clouds. The halo is circular and exactly 22 degrees in radius, but it looks squashed because of the distortion of the extremely wide-angle lens. Surrounding the zenith (the point directly above the observer) and always at the same altitude as the Sun is a lovely parhelic circle, caused by sunlight reflecting from ice crystals with nearly vertical faces. On average more common than rainbows, beautiful ice halos can often be seen in planet Earth's sky by those who know how to look for them.